Decorate your life with beautifully patterned and dyed tape made in Japan from washi, a type of Japanese rice paper. Perfect for crafting and decor, this tape can be used for gift wrapping, book decorating, layering, trimming, card-making, letter-making and more! It's also easy to tear, can be written on and can be applied to walls and furniture as well. Available in light (right), dark (middle) and traditional (patterned) washi (left). I used this to tape numbers on vintage books for my wedding table numbers. They look fantastic, and it is removable! If you are like me, and want to make packages pretty, it doesn't get better than Japanese paper and wrapping products. Very artful and also practical. Such a fun addition to gift wrap! 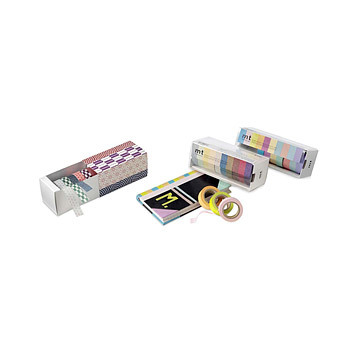 Great gift for a card maker! My aunt who makes cards loved this set, which I purchased for her for Christmas. It will definitely serve her well! The tape wasn't worth [$]. Perhaps adhesive is expensive in general, but I would have estimated that this was worth $10-$12 at the most. This is very pretty and adds alot to giftwrapping! What a treat to find these paper tapes....I only wish there were more patterns to choose from! Thank-you for carrying them! This tape makes everything that you would use tape on a little bit more fancy and fun. I am happy that I ordered it and wish that I had gotten both sets. I also plan to order this as a gift for a crafty friend of mine. This will be used as a gift for my 20 year old arty daughter. She uses decorative tape on everything-packages, letters, notes. The tape is attractive, and well packaged if expensive. Perfect for crafting and decor this Japanese Washi tape can be used for gift wrapping, book decorating, card-making and more. Available in 3 styles.